My background is in Industrial Design and I have worked now in design and engineering in Assistive Technology for over twenty five years! I’ve spent time working in industry and at a number of centres in the UK, USA and Mexico. I discovered AAC while studying for an MSc in Assistive Technology and realised how diverse and inspiring the field is! I’ve always loved the people and challenges of working in Assistive Technology. In my current role, I manage the engineering aspects of the service across both offices. 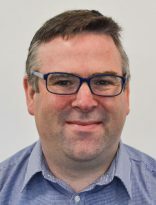 I am an active member in the Assistive Technology community, being the current chair of RESMAG (Rehabilitation Engineering Services Managers Group) and on the Conference, Education & Communications (CEC) Committee of the Posture and Mobility Group. We work with some amazing people at Ace Centre, and try to use good design to ensure our team and clients can get the most out of systems we provide. I am really keen on applying new manufacturing technologies to this field to reduce cost and enable bespoke solutions to be developed more effectively using the latest techniques.